Russian writer; born in Letichev, Volhynia, in the second half of the eighteenth century; died in St. Petersburg Aug. 1 (13), 1831. As the friend and protégé of Abram Peretz he went to St. Petersburg toward the end of the reign of Catherine II., and engaged in commercial pursuits; but he soon turned his attention to literature, in which he achieved some success. He was among the first Russian Jews to gain a mastery of the Russian language. Nevakhovich was familiar with the writings of his day, and was a linguist, a student of philosophy, and an ardent admirer of Moses Mendelssohn. He took great pride in his patriotism, and in his writings expresses his gratitude for having been permitted to see the growth of Russia. He was inclined to be optimistic in regard to the future of the Jews and assumed that they would be granted greater liberty. Later, Nevakhovich was baptized into the Greek Orthodox Church. In 1817 he lived in Warsaw and was connected with the Ministry of Finance. In 1831 he went again to St. Petersburg in order to place one of his plays on the stage, but he died before he could accomplish his purpose. Nevakhovich, with his friends Peretz and Notkin, made a determined effort to secure recognition for the Jews of Russia. Under the title "Vopl Dcheri Yudeiskoi," he wrote an urgent appeal to the people of Russia, calling upon them to show a spirit of tolerance and justice in their dealings with the Jews. In this appeal he shows how the Jewish people have been maligned, and insists that the Jewish religion tends to produce good men and good citizens. "For centuries," he says, "the Jews have been accused by the peoples of the earth. They have been accused of witchcraft, of irreligion, of superstition. . . . All their actions were interpreted to their disadvantage, and whenever they were discovered to be innocent their accusers raised against them new accusations. . . . I swear that the Jew who preserves his religion undefiled can be neither a bad man nor a bad citizen." While it is not known to what extent this appeal influenced legislation in regard to the Jews, it undoubtedly had some effect. 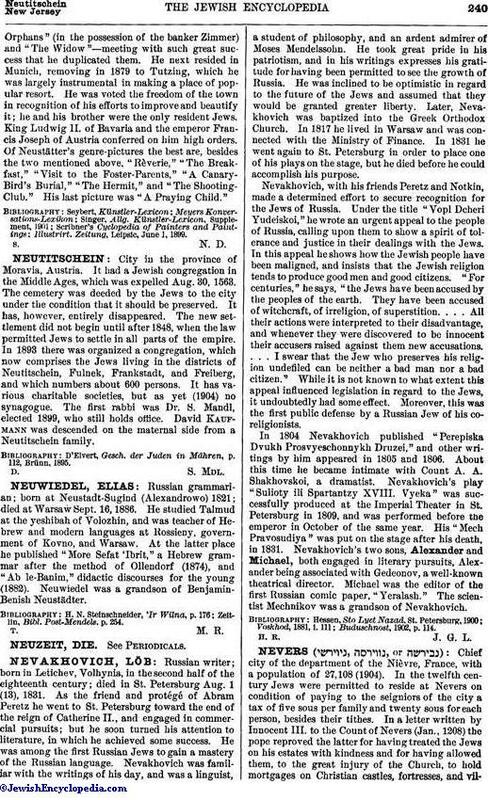 Moreover, this was the first public defense by a Russian Jew of his coreligionists. In 1804 Nevakhovich published "Perepiska Dvukh Prosvyeschonnykh Druzei," and other writings by him appeared in 1805 and 1806. About this time he became intimate with Count A. A. Shakhovskoi, a dramatist. Nevakhovich's play "Sulioty ili Spartantzy XVIII. Vyeka" was successfully produced at the Imperial Theater in St. Petersburg in 1809, and was performed before the emperor in October of the same year. His "Mech Pravosudiya" was put on the stage after his death, in 1831. Nevakhovich's two sons, Alexander and Michael, both engaged in literary pursuits, Alexander being associated with Gedeonov, a well-known theatrical director. Michael was the editor of the first Russian comic paper, "Yeralash." The scientist Mechnikov was a grandson of Nevakhovich. H. R. J. G. L.